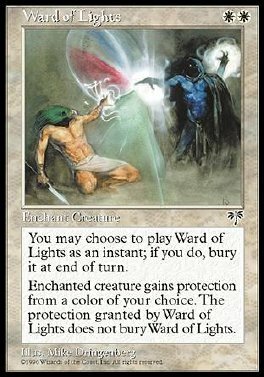 You may play Ward of Lights any time you could play an instant. If it was played any time a sorcery couldn't have been played, it gains substance until end of turn and when it loses substance, sacrifice it. Enchant creature As Ward of Lights comes into play, choose a color. Enchanted creature has protection from the chosen color. This effect doesn't remove Ward of Lights.